Thank you so much for considering Camp Shohola for your son. We consider it a great joy and a great responsibility to have hundreds of boys entrusted to our care each summer. Your son will want to know that he’s going to have a ridiculously good time while he’s at camp. You will want to know that he’ll be safe and happy. 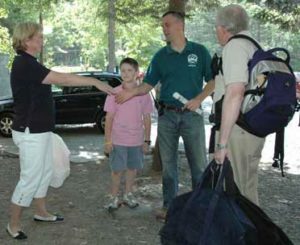 We want you to know that we will do everything in our power to ensure your son’s safety and happiness and that you can contact us at any time during your decision making process, or while your son is at camp with us. Give us a call, come to one of our “Meet the Directors” weekends, or even come for a tour of camp if you like. We’re always here for you. Over the three generations that Shohola has been operated by the Barger family, a tradition of excellence has been forged. There are three main areas in which our excellence shines through. The program at Shohola offers unbeaten variety and excitement. Campers take responsibility for their own summer experience by choosing their activities. Then they follow through with their choices as they follow their daily schedule. Every activity is instructional, and the new skills the campers learn, and the successes they experience foster a healthy self confidence. Shohola’s facilities have continued to change and to grow to keep up with the interests of today’s campers. They have also been maintained to ensure safety and to preserve the traditions and the history of the camp. Our operations and our facilities are kept in top notch condition and inspected by the American Camp Association as part of our accreditation. Our safety record at camp is impeccable. Shohola counselors and staff are hand selected to create our nurturing environment while also offering great role models for boys to follow as they become young men. Many of our counselors were once campers themselves, and they return for years, keeping the traditions alive into the next generation. Great care is given to train counselors to make sure that we are offering your son our very best.